For the next installment in their never ending stream of releases, experimental rock trio Deerhoof take on a more accessible edge and feature a number of guest musicians. To any fan of experimental and alternative music, the list reads like a gold mine: Lӕtitia Sadier of Stereolab, the aggressive and hilarious Awkwafina and the conceptual and progressive saxophonist Matana Roberts are a few among the many talented musicians on Mountain Moves. What’s a shame is that the guests are, for the most part, underused. On “Slow Motion Detonation,” Juana Molina hangs around background vocal territory, never really coming into focus. Awkwafina delivers a short verse on “Your Dystopic Creation Doesn’t Fear You” that’s mostly ad-libs, skipping out on her normal eccentricity. On “Sinalong Junk,” Xenia Rubinos—who already makes political, colorful music—sings a wordless melody over one of the album’s drier musical cuts. 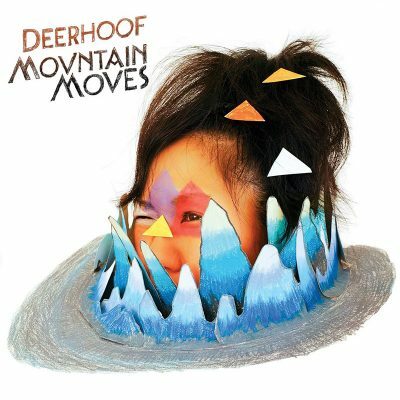 Instead of using these artists for their unique styles, Deerhoof fold them into the mold a bit awkwardly. The key exceptions are Lӕtitia Sadier and Matana Roberts. On “Come Down Here and Say That,” Saider plays a stately, powerful foil to Satomi Matsuzaki’s playful voice over a funk beat before she takes the lead on a dreamier, more spectral section. The title track with Roberts has one of the most mind-bending instrumentals. A clunking beat and syncopated singing creates the perfect, twisted ground for Roberts’ more fast-paced playing to lay out on. Still more composition missteps come in the song structures. Deerhoof come across as oblivious to traditional structures. Instead, they favor through-composed, non-linear tracks, most containing two or three distinct sections. This move only works some of the time (“Come Down Here” as the standout example), but on many others, the lack of cohesion makes the tracks feel like bad rough drafts (“Ay That’s Me” and “Sea Moves” are especially underwhelming). Despite all this, there are countless enjoyable elements to Mountain Moves. The group writes some of the catchiest melodies I’ve heard all year, saying nothing about how they manage to put these over the complex web of different time signatures. Greg Saunier is still one of the greatest drummers in rock, guiding his heavy, crashing drums through the multifaceted compositions. Tracks like “Begin Countdown” and “Palace of the Governors” are Deerhoof at their finest, and they find accessibility, too. No matter how much “I Will Spite Survive” sounds like “Jessie’s Girl,” it’s hard not to feel the band’s powerful energy. Satomi Matsuzaki’s singing again stands out as Deerhoof’s attention-grabbing centerpiece. Her expressive delivery and melodic skill give each track a perfect focus point, keeping the rambunctious music from losing control of itself. Her lyrics are less abstract than usual, but she uses this to dabble in political writing. Refrains like “You can outlive your executioners” and “Celebrate [the] future that you could have saved” sit in a median place that seems both dejected and empowered.